By choosing Fristads flame protective garments, you get the ultimate protection according to the latest European norms. All garments are carefully tested - comprising everything from strength, tensile and abration, to real life usability and comfort. Our wide asortment makes it easy for you to find the flame protective workwear that your occupation and risk assessment while adding to your safety. The flame protection in our Flamestat collection is inherent - the flame protection fabric is integrated in the fibres. In addition to supreme protection and comfort, Flamestat also allows you to enjoy full protection throughout your garment’s lifetime. The fabrics in our Flame collection are flame retardant treated. The protection is bound to the fabric and is durable over time provided the garments are properly washed. Our underwear with inherent flame protection increase both your comfort and your protection. Flame protective garments protects you from flames spreading. However heat can spread through the garment burning the skin. If you wear flame protective garments they will protect you against heat for for a certain period. The period of time during which you are protected is increased if you also wear flame retardant underwear. For you working as an electrician, industry worker or with maintenance and need protection against heat and flame we have durable trousers, shirts and sweatshirts in light and flexible materials. Great comfort and, high heat insulation and protection against second degree burns. In our high performance Flamastat Multinorm collection you find a wide selection of everything from t-shirts, to winter garments. The garments are certified according to several European norms - such as electric arc, heat and flame, electrostatic discharge and splashes of liquid chemicals - to protect workers in many differrent professions and most risk assessments. 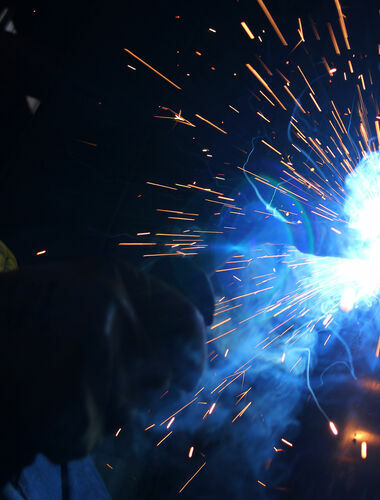 Do you work as a welder or in a foundery - choose garments that protects you from molten iron and aluminium. These garments are also designed to stand dirt with details in high vis yellow for enhanced visibility. Some of the lightest flame protective functional garments on the market today. Made of wind- and waterproof GORE-TEX material with high breathabiity. Great comfort in combination with the highest protection against electric arc, heat and flame, electrostatic discharge, heavy welding, molten iron and splashes of liquid chemicals. The ATHS fabric has inherently flame retardant fibres protection and is made from modacrylic, cotton, polyamide and anti-static fibres. The fabric’s surface is dirt, oil and water repellent and the reverse side has a soft surface, providing a comfortable feeling next to the body. The ATHS fabric is a lighweight material which makes the garments comfortable to wear and allows for better freedom of movement. The fabric contains polyamide for stronger resistance to wear and tear. This fabric provides excellent heat insulation and prevents second-degree burns, it is quick drying and has excellent moisture management properties. The fabric and the reflective tapes withstand all our high requirements. We recommend industrial washing at 60° for our ATHS garments. Leasing laundry-tested according to ISO 15797 for 50 washes. High vis colours are approved for 25 washes. The material has inherent flame protection and it is made from modacrylic, cotton and anti-static fibres. The surface is dirt, oil and water repellent. It is a heavier fabric than our ATHS fabric, but still provides great comfort with a soft reverse closest to the body. Thicker material provides better protection against electric arcs and these garments can withstand energy equivalent to a full 16.8 cal/cm2 in this protective layer. This fabric provides excellent heat insulation and prevents second-degree burns, it is quick drying and has excellent moisture management properties. The fabric and the reflective tapes withstand all our high requirements. We recommend industrial washing at 60° for our ATHP garments. Leasing laundry-tested according to ISO 15797 for 50 washes. GXE is the new lightweight and flexible GORE-TEX 2-layer material providing greater freedom of movement for the wearer. It is waterproof and windproof as well as breathable, and the fabric remains light and flexible even in wet conditions. The GXE fabric is made of polyester and antistatic fibres with a flame-retardant and electric arc-protective laminate. The material has inherent flame protection in the sense that the flame-protective performance is included in the laminate. No flame retardant treatment of the outer textile is added. The fabric’s protective performance is exactly the same on the first day of usage as it would be after years of using and washing the garment. 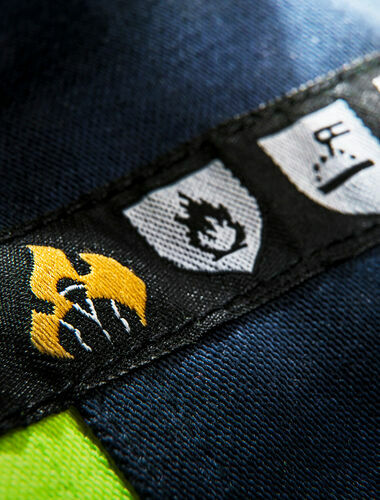 The high-visibility GXE fabric provides outstanding Multinorm protection and is certified for a wide range of hazards. The garments are electric arc-tested for both Box test and Open Arc, with very high ratings. The heat and flame protection also includes molten metal splash resistance. In addition, the fabric is approved for heavy welding class 2, has electrostatic properties and protects against liquid chemicals. Approved for 30 washes at 60°. Our MFA fabric is an inherent flame retardant fabric, which is designed to protect the wearer from splashes of molten metal in the foundry sector. The material’s composition, 60% viscose FR, 20% wool, 10% lyocell, 10% polyamide, combines viscose FR with nature’s own natural anti-flame fibre, wool, which together have very good thermal insulation properties. The polyamide fibres with their strong properties provide further strength. MFA has the highest degree of protection according to EN ISO 11612 D3 for protection against splashes from molten aluminium and E3 for splashes of molten iron. Fristads MOF fabric is a blend of soft inherent modacrylic with top-class cotton and elastane in a flexible, single jersey quality. The modacrylic fibre has an inherent permanent flame retardant protection and this combined with cotton, provides a stable and strong product with good thermal insulation properties. MOF is pre-shrunk and withstands machine washing. The material is approved for electric arc box test. Protection against heat/flame, electric arc and antistatic. Devold® UD is an elastic rib-knitted material of viscose, Merino wool, anti-static fibres and durable polyamide. Fristads MFR fabric is a flexible, thermally insulating, fleece with smooth outside and soft, brushed reverse. Perfect as layer 2 garments. Modacrylic, with inherent flame retardant properties, mixed with top-class cotton and elastane, provides permanent flame protection. The garments are tested according to both electric arc box test and the open arc test. MFR fabric is pre-shrunk and withstands machine washing. Our Flame collection consists of comfortable, hardwearing, electric arc tested products. All garments protect you from heat and flame, electric arc and many garments in the collection are also approved for welding. The flame retardant treatment of the fabrics is approved accoring to EU's REACH regulations. Comfortable and durable garments approved for welding class 1. Designed to stand dirt with high vis details for enhanced visibility. The jacket is also available as winter jacket with a dirt, oil and water repellent outside. To meet the high demands of welders, rail workers, miners and foundry workers you can choose these garments. Specially designed to provide great protection against welding sparks, radiant heat and splashed from molten iron with reinforcements at front, on sleeves and thighs. 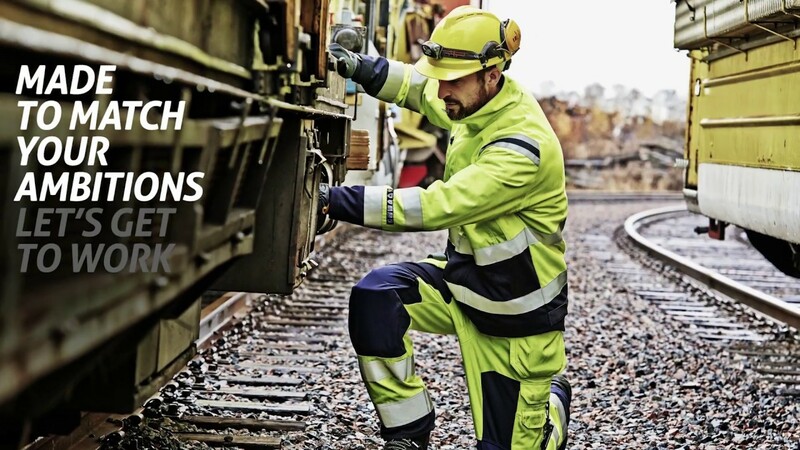 Together with Fristads MOF-underwear (EN ISO 116612) you reach protection against welding class 2. Comfortable and durable garments protecting you from heat and flame and electric arc. Though against dirt with high yellow details for enhanced visibility. Perfect for you working as an industry electrician. Our FLAM fabric is a comfortable material made of 75% cotton and 25% polyester. The high visibility collection is made of an improved new FLAM fabric also offering electrostatic discharge protection, thanks to the element of 1% antistatic fibre. The high proportion of cotton provides easy comfort next to the body and the share of polyester gives high durability. We recommend industrial washing at 85°. Leasing laundry-tested according to ISO 15797 for 50 washes. High vis colours are approved for 25 washes. Wearing several layers of garments will increase the amount of energy that the garment system can withstand. Flame protective garments protects you from flame and heat during a certain amount of time. Flame retardant underwear extend the time you are protected from heat and improved your protection against second degree burns. Adding an extra flame protective layer provides even greather protection. The same is for garments certified for electric arc. At Fristads we have conducted unique electric arc tests for different clothing combinations to ensure the exact values. Watch our movie to learn more about our electric arc tests and dressing layer on layer. See all electric arc tested garment combinations in the tables below. For you working in environments where flame protective garments are required there are strict rules on how to dress. Which protection you need is determined by an analysis off all potential hazards. We have a great assortment of flame protective garments to guarantee the right protection according to the latest European norms. Your safety is our top priority. We have also taken the electric arc protection one step further and conducted unique tests for specific clothing combinations. Fristads is market leading in electric arc certification. We present exact values on specific garment combinations. This also includes Box test class 2. ​​​​​​​To ensure the exact values the tests are made on all garments together, layer 1-3. It is not possible to calculate a correct value by adding the values of each garment. The table is updated ongoingly. A risk assessment shows possible hazards at your work. The findings from this study helps in determining suitable garments that offer the right protection and the best comfort. Examples of hazards that are investigated in a risk assessment are convective heat, high radial heat, flame contact, steam, molten metal, hot surfaces, high voltage, electric arc and static build-up. ​​​​​​​Here you can read mote about the different flame certifications and how much protection you need in different occupations.